Geologists hope to better understand the formation of rare metals in Scotland amid rising demand for them for energy devices and mobile phones. Metals such as tungsten and cobalt are imported from abroad and are not currently mined in the UK. 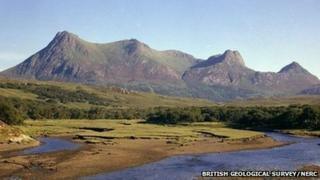 British Geological Survey (BGS) is examining how rare earths were formed near Tongue in north Sutherland, but not how they could be exploited. Areas of Shetland and Aberdeenshire also have deposits of rare metals. BGS is looking at the science of the materials, examining the types of geology in which they occur and the way that they were formed. However, the research is not looking at the mining of the metals. Data gathered could be used to identify rare earths at other locations in the world with similar geology. Some of the Scottish sites have been known about since the 1980s when there was not a high demand for the raw materials. The UK and European Union now imports large amounts of the rare metals for use in the manufacture of wind turbines, solar power technology, electric vehicles and mobile phones. BGS said the economic worth of deposits in Scotland was not known at present. It said Sutherland was the main focus of its research work. Principal economic geologist, Gus Gunn, confirmed the study. He said: "BGS is currently undertaking research to understand the processes responsible for the rare earth enrichments in Sutherland, although considerable further work would be required to identify any economic deposits of critical metals in Scotland." Metal has historically been mined in the Highlands. Strontium, a metal found in the mineral strontianite, was mined near Strontian in Ardnamurchan after scientist Sir Humphry Davy first isolated it in 1808. Lead was mined near Strontian in the 1700s to make ammunition for muskets and artillery weapons during the Napoleonic wars. At their height, the lead mines provided employment for hundreds of workers. Iron ore was also mined on Raasay, an island off Skye. During World War I, German prisoners of war worked at the open cast mine.